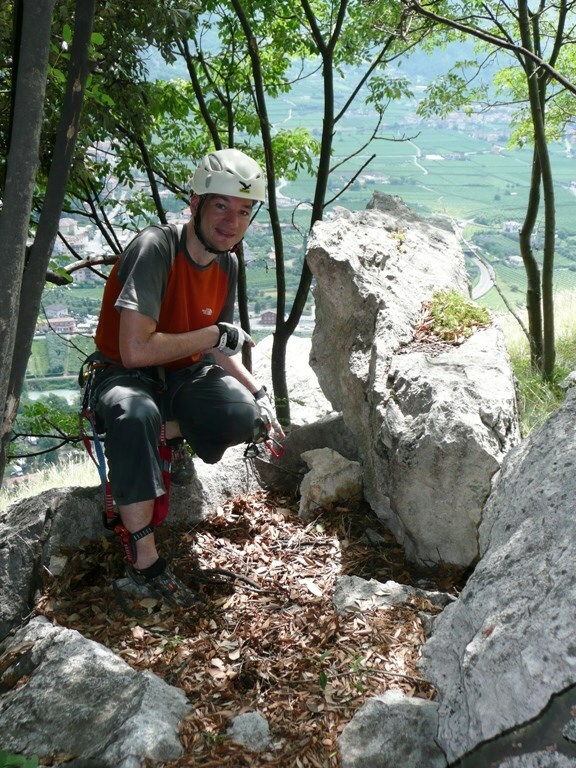 Lake Garda is a via ferrata paradise. Many of them were built through wars, in order to provide easier passages for soldiers i.e. to high bunkers and alike. Luckily with no wars anymore we take the best out of it for fun. Old trails are renewed, new ones built. This little series intends to show you the essential ones around Riva and Arco in three different categories. First, there is the beginner level: The Sentiero attrezzato Colodri (visit link) It is a short and easy ferrata which is often used by climbers to descend. Experienced ferraristi may even go without any gear, but of course we do not recommend it. Second, there is the advanced level: The Via dell'Amicizia, the friendship trail (visit link) As a typical mountain ferrata it leads you to a summit (the Cima SAT). The Amicizia goes up 1200 altitude meters, half of it is climbing, and it contains the most popular and one of the longest iron ladders of the Alps. You need endurance and mountain experience (weather, falling stones, etc.). Third, there is the Expert level: Via attrezzata Monte Albano (Mori) (visit link) It is much shorter (only ca. 400 altitude meters), and does not peak at a summit, but that does not make it easier. It is a very airy trail with lots of exposed passages and crossing sections, the most popular one being the “Traversata degli Angeli”. It is more of a sports ferrata and therefore requires some power in addition to endurance, too. If you like this series you might feel to explore the area further on the hunt for more climbs. We recommend the “Che” Guevara and the Pisetta, both tough challenges beyond what you experienced here … maybe you want to place a container there even so we could log it then when we come back ;-) Also, a geocache is already available at the Drena ferrata GCP74F (visit link) . Please take all necessary precautions for a mountain tour: There are lots of websites on the internet where you can find further information on the trails, including even You Tube, etc. You need a helmet, ferrata gear, respect the weather, bring lots of water, etc. 4 liters might just be enough on hot summer days …! You can often buy gear fairly cheap at one of the Arco mountain stores, make sure to compare prices though. Enjoy and take care! Remember: You go at your own risk and responsibility!! A general note on cache maintenance: Maacher regularly visits the area and will share the maintenance with me. To reach the cache, just walk up the nature trail to its very top. 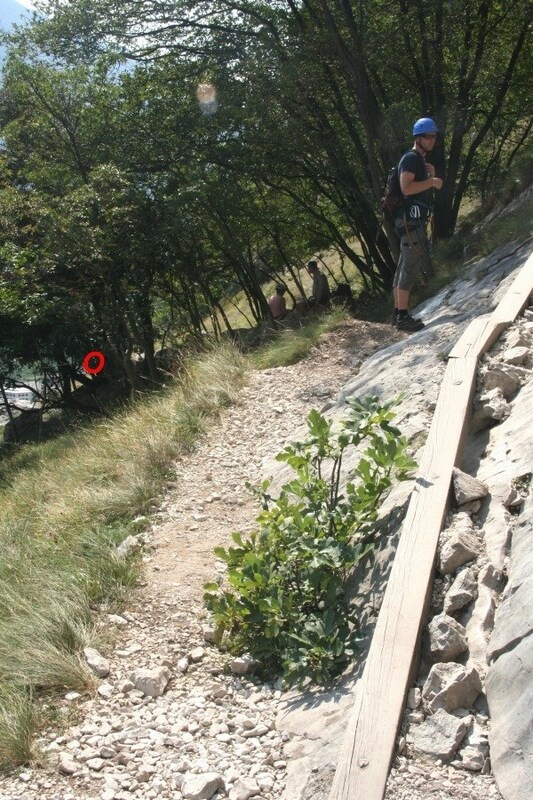 The ferrata start is well marked there. At about half the way on the ferrata itself, you see a nice, safe area on the left ideal for a little break, with grass and some trees. The cache is at the last stone/tree and can be reached safely (no need to do crazy stuff). From there, just continue up to the exit and if you like walk on to the other Colodri caches GC25Y3R (visit link) and GCP9W8 (visit link) As a descend, you have different options, the shortest one being the via ferrata you came up. Also, you might go round the mountain on either side on different trails then (i.e. Laghel, etc.) depending on your preference. da ich zur Zeit nicht zum Cache kommen kann, bitte ich den nächsten Cacher ein neues Logbuch in den Cache einzulegen. Bitte laßt mich wissen, wenn jemand das getan hat. Cachebehälter ist ein Pettling. because I cannot come at the moment to the Cache, I ask the next Cacher to insert a new logbook in the Cache . Please let me know when somebody had done this. Cachebox-size is a Pettling.